Apeiron Packaging has a variety of standard ATA or "Roadie" case products. We build all popular styles, 3/8" walls with rugged recessed hardware, and standard rack mount cases as well. Custom ATA cases are a 2-3 week Delivery ARO. We offer a wide variety of hardware options, laminates, sub-straights, and color. Casters are also available in many tire sizes, tire materials and brake configurations. 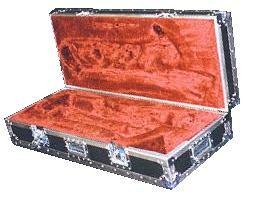 Rack cases are EIA Standard 19" with the rails normally set back 7/8" from the front edge of the case. Standard depths are 16", 18" 20" and 22". Conventional and floating racks are available. Floating racks are available with front and rear removable lids or pull off lid configurations. All of our inside racks on our floating rack products are completely surrounded by foam.